Shares in Asia were flat on Thursday, with investors on the sidelines ahead of the U.S. Federal Reserve’s annual Jackson Hole meeting, set to start later in the trading day. The Nikkei Stock Average was up 0.04%, recovering from earlier declines in the session. Hong Kong’s Hang Seng Index was flat, the Shanghai Composite Index was 1.1% lower and the South Korean Kospi added 0.1%. Traders remain fixated on what U.S. Fed chair Janet Yellen will say at her speech at the Jackson Hole meeting of central bankers on Friday, where many hope for some guidance as to when and at what pace the world’s biggest economy will raise interest rates. However, some analysts say that even the expectation of guidance was wishful thinking. “I think people are reading way, way too much into Jackson Hole,” said Kay Van-Petersen, Asia macro strategist at Saxo Capital Markets. “There’s a lack of direction generally in the market and I think people are almost creating scenarios because they want direction. From our perspective, it just doesn’t make sense for Yellen to posture [to one side or the other]; I think she’ll just keep the options open,” he said. Declines overnight in the commodities prices weighed on the major commodities-producing countries, such as Australia. The S&P/ASX 200 was last down 0.1%, while in Singapore, the Straits Times Index added 0.1%.. Brent crude, the global oil benchmark, was unchanged at $49.04 a barrel. The Japanese yen was relatively flat against the U.S. dollar on Thursday, but analysts expect that the dollar could strengthen on Ms. Yellen’s upcoming comments. Automotive exporters are benefiting from that view, with Nissan Motor Co. up 1.6%, and Mazda Motor Corp. rising 2%. Elsewhere among big movers on the Nikkei, staffing agency Recruit Holdings Co. plunged 5% after the company said some of its existing stockholders are looking to offload shares. In Hong Kong, shares of Chinese oil majors came under pressure after the release of disappointing earnings the previous day. Offshore oil producer Cnooc Ltd. was trading down 1.1% after the company posted a 7.7 billion yuan (US$1.16 billion) net loss, compared with a 14.7 billion yuan net profit in the first half last year. Meanwhile, PetroChina Co. was also down 1.1% after its first-half net profit plunged 98% from a year earlier. The third main Chinese oil giant, Sinopec, is due to report in coming days and could spark more stock volatility, analysts say. Sinopec’s Hong Kong-traded shares were last up 0.7%. 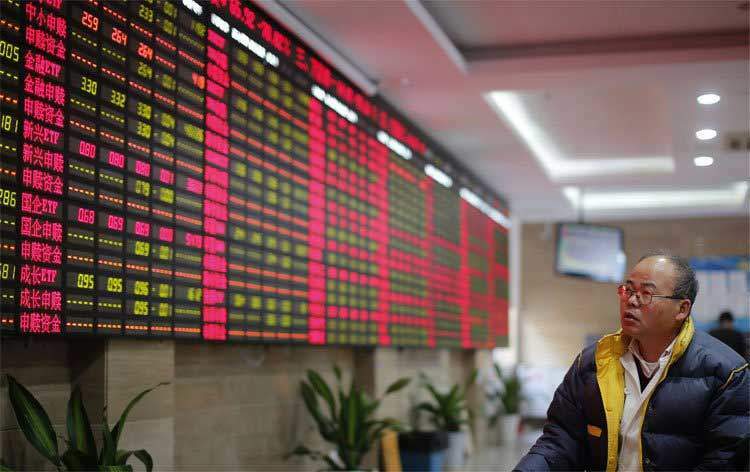 In mainland China, stock markets were down amid tighter market liquidity. China’s central bank in recent weeks has moved to reduce the amount of cheap, short-term credit in the financial system by replacing the seven-day reverse repurchase agreements — which are effectively loans to commercial banks — with 14-day ones. Analysts say that the expected strain on liquidity, particularly around the end of the month, spooked investors to cut positions on Thursday. China’s central bank responded Thursday morning by putting more cash into the financial system, in an apparent gesture to calm a nervous market. The People’s Bank of China offered 80 billion yuan worth of 14-day reverse repurchase agreements in its daily money market operation. The nation’s money markets reacted positively to the intervention, with the weighted average of the seven-day repo rate, a benchmark measure of money market borrowing costs, falling to 2.40% from a high of 2.53% Wednesday.